We would like to thank everyone who helped make this last season a success for us! We wrapped things up in October for charters this season as some regulation changes made things a little tricky. With the early change in the weather we stuck to tuna fishing on days that we could get out there comfotably. The charter season ended with the striped bass bite staying strong and bottom fishing was good when we could get out to where we needed to go. 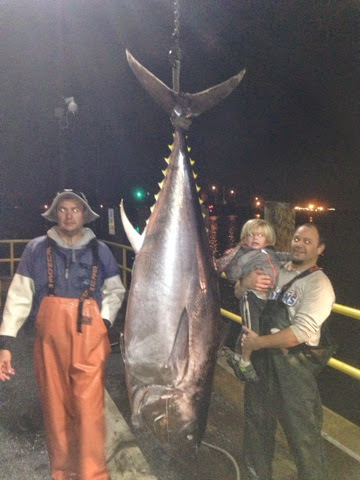 As for our tuna season we did finally manage to boat a keeper. Captain Derek got one that dressed out at 300 lbs. We ended up with about 15 tuna trips under our belt before we finally found a dumb one. We did lose 2 others prior to boating that fish. The future of the bottom fishing was very uncertain in the fall when the Feds implemented their "emergency cod closure" however we have recieved a bit more positive news as of late. As of right now we are not allowed to fish in the "rolling closure" areas. There is a proposal that has been passed by the fisheries council and is awaiting a federal stamp of approval that would allow us to fish wherever we wanted again. There are also some rumblings about increasing the bag limit on haddock. I will believe all of this when I see it in writing of course but there is at least some reason for optimism. These regulation changes have been severe and in mine and many others opinions unnecessarily so. We all want to have fish to catch in the future and we all understand that things can not go back the days of unlimited fish with no size limits. The issue to me is going for unlimited haddock at 18" to 3 keepers at 21" to 0 anything for a large majority of the year in a very short period of time. All this while the people who are actually out on the ocean are not seeing what the people setting the regs are telling us is going on. It's obvious whatever research is going on could use a lot of fine tuning. One study says no fish a few months later they say plenty of fish and a not long after that it's back to no fish. I have very little faith in this process, there is a long history of mistakes, hypocrisy, and ignorance.... I'm rambling and could continue all night but I will stop myself here to keep my blood pressure at a reasonable level. The boat is hauled out now and is undergoing some painting and some reconfiguration. We plan to add some lights under the cap rails to help light up the deck for night fishing and are looking into possibly adding some underwater lights which would make for a cool effect during night striper fishing. We plan on having the boat ready to fish for the beginning of May. If the closure changes we can be ready sooner but as it stands we will be ready and just waiting for the fishery to open up. I will post some pictures of the boat as we get it prettied up and keep you updated on any news regarding the regs. For now I would like to wish everyone happy holidays from us here at steaker charters! I hope to see you all in a few months when we open up!